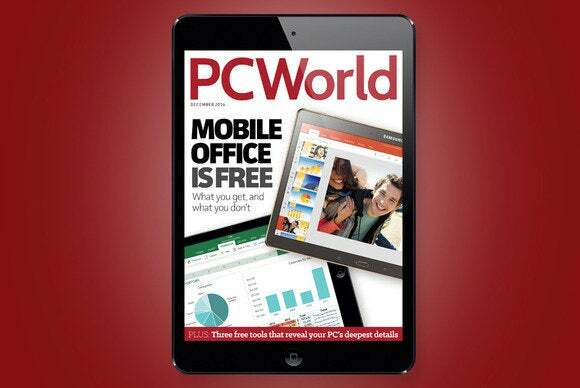 Microsoft Office mobile is now free: Read about that in the December Digital Edition. Microsoft releases the mobile version of its Office suite for free. We explain what you get and what you don't. • Quality of Service explained: Discover why routers with strong QoS make better home networks. • Phablet vs. mini-tablet: As phones grow and tablets shrink, they’re merging in form, but not always in function. We size up the key specs and differences you should care about. • Outlook organization tips: Learn five ways to cut through inbox clutter and tame your email. • Microsoft Band: Microsoft’s fitness tracker is so feature-packed, it’s practically a smartwatch. Editor Jon Phillips straps one on his wrist and gives his assessment. • Dell XPS 18: Senior Editor Michael Brown takes a look at the Dell XPS 18 for a spin and pronounces it a nearly perfect tablet-desktop hybrid. Current subscribers can visit PCWorld.com/directions to learn how to access PCWorld on any device and start reading the December issue right away. Not a subscriber? With the PCWorld Digital All-Access Pass, you get access to the digital magazine on as many devices as you’d like as an Enhanced Edition or Replica Edition. Depending on your tablet reading preference, choose Replica (digital version of a print magazine in a PDF-style format) or Enhanced (added interactivity)—or download both and see what you prefer. Subscribe today, or to learn about other purchasing options visit PCWorld.com/magazines.